Marni Marshall is ready to work on getting vacant store fronts filled as the new Grass Valley Downtown Association executive director. Marni Marshall had to hit the ground running as soon as she was hired as the new executive director for the Grass Valley Downtown Association. As if ensuring the success of Cornish Christmas — a five-week event celebrating its 50th anniversary — wasn’t enough pressure, Marshall was responsible for a slew of other holiday events, all while acclimating herself to her new position and introducing herself to downtown’s merchants. Since September, she said, the association hosted the Holiday Market and Safe Trick or Treat, added on a daytime Mill Street event with a tree lighting ceremony, helped with the Beale Air Force Appreciation event, put on a Holiday Merchant Mixer, and fundraised for Cornish Christmas sponsors and new downtown holiday lights. Marshall and program manager Marissa Hernandez added vendors and scheduled entertainment to Cornish Christmas, and in what she called a big accomplishment, persuaded owners of empty storefronts to let local artists decorate their windows. After the last Cornish Christmas on Dec. 22, Marshall took just a few days off to celebrate the holidays with her family and was back at work, cleaning up her office, on Thursday. Marshall is not a newcomer to the area, having lived here since 1994. She had worked with Hernandez before, putting on modern dance events for more than a decade. And she was familiar with downtown as well, after working for the Center for the Arts for eight years. 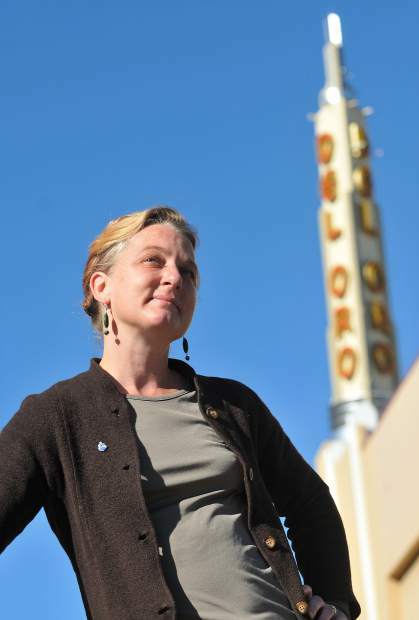 As house manager and then project manager at Center for the Arts, Marshall said, she was responsible for handling funds, promotion, coordinating volunteers and vendors, and working with other local organizations — all skills that are coming in handy with the Grass Valley Downtown Association. “That gave me a lot of experience for this position,” she said. Marshall’s hiring came after several years of turmoil within the downtown association. Julia Jordan, who took over as director from Grass Valley Mayor Howard Levine in 2012, was charged with embezzlement of association funds after she resigned in February 2015. The case against Jordan ended this year when the former director paid almost $2,000 — the amount prosecutors said she improperly took from the association. Diane Raymond became director after Jordan resigned, but left after one year, leaving the association without a formal leader for a year until Marshall’s hiring. Marshall credits Hernandez and Shanin Ybarrando, who was hired to coordinate events, for keeping things running. “Now we have two people with energy and time to improve them,” she said. Marshall stressed that her job is not to completely change the traditional events, but to keep them interesting for repeat attendees and invite new attendees to visit and stay in downtown Grass Valley. For Cornish Christmas, Marshall wants to bring back some traditions that have fallen by the wayside, like getting students to make ornaments to decorate the Christmas tree. Next up for the association is Foothills Celebration, and Marshall hopes to take advantage of the burgeoning local craft beer scene by adding a beer tasting to go along with the traditional wine and food pairings. One project Marshall wants to take on is adding more public art, by creating bike racks in collaboration with bike organizations and students in town. Fundraising is going to be a big part of her vision. To make those dollars stretch farther, Marshall has been hard at work building up her volunteer base and recruiting new vendors for events. One item that is high on her priority list is helping downtown’s merchants stay viable, including marketing workshops on the effective use of social media. The flip side of that is filling some long-standing vacancies with businesses that will do well. All in all, said Marshall, the last quarter of 2017 went well — and she is looking forward to 2018.